Ready for Immediate Move-in. This impressive two-story home is located on a perimeter homesite which offers privacy, a 5' fence and MOUNTAIN views from the back of the home. The main floor features an open gathering room with traditional fireplace, casual dining area and gorgeous kitchen with grey painted cabinets, black and white granite countertops, stainless steel appliances and walk-in pantry! Convenient main floor office space in addition to a guest bedroom with en-suite bath. The second story boasts a large owners bedroom, two secondary bedrooms with a shared bath, upstairs laundry room and a loft. This home has a variety of high-end finishes including a full basement with rough-in plumbing, beautiful open wood railing to the second floor, 2-tone paint throughout, soft close doors and drawers in the kitchen, french doors in the study, professional front yard landscaping and central air conditioning. 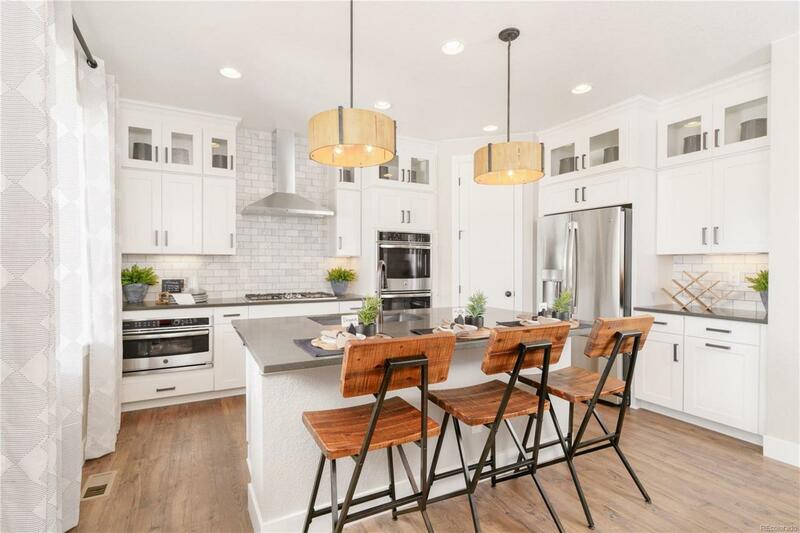 Photos shown depict model home and are not the actual finishes.